Lenny: Santa Cruz Chameleon 27.5+. Came off of a Rip Niner, full suspension clip less pedals. 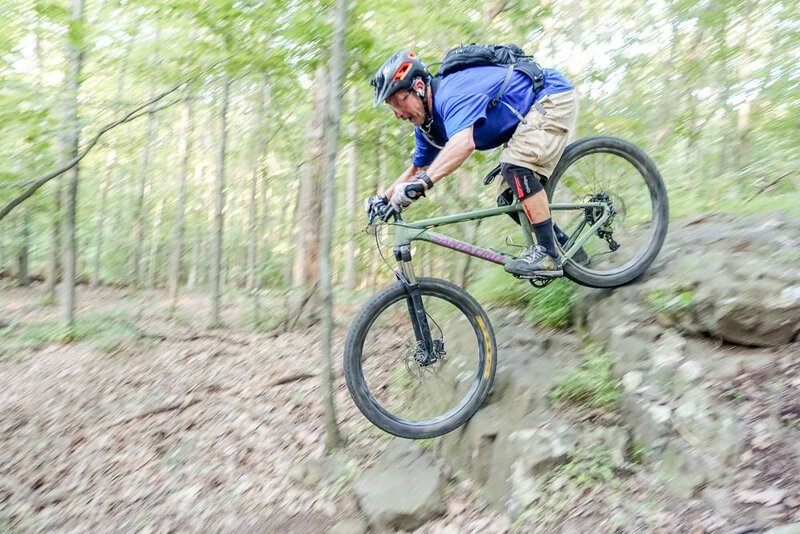 Chameleon hard tail is awesome with flat pedals, handles everything excellently to rock gardens, steep roll downs, and corners great on fast downhills. Took it to Mountain Creek and had a blast with it, fun bike! Love it! Lenny: Ringwood is my favorite place. Several parking options, close by metro area, numerous loops - each different, with lots of flowy, rocky, techy, and long fast downhill trails (Red Trail). Also it's scenic. 2nd choice would be Blue Mountain, NY. It's a hike away but a great place. Lenny: Nepal. How cool would it be to ride the Himalayas? Lenny: RIDE, RIDE, RIDE! Don't buy a bike and watch it collect dust. Buy local! Lenny: The rider in front of me so I can chase him/her or the rider behind, not buzzing me.